Gary George Brokaw was born January 11, 1954 in New Brunswick. A talented athlete with great strength and anticipation, Gary was drawn to basketball and honed his game in the local youth leagues and on the city’s playgrounds during the 1960s. He enrolled at New Brunswick High School in 1967 and was the star of the basketball team by his junior year. Gary scored 2,028 points in his varsity career at New Brunswick. As a senior in 1970–71, he averaged 34 points and 14 rebounds as the Zebras went 23–4. Recruited by several top schools, he chose to attend Notre Dame on a full scholarship. His first year was also the first year for coach Digger Phelps. Elizabeth's John Shumate joined the varsity a year later. Gary stood 6’2” when he entered college and grew two more inches while in South Bend. In Gary’s junior year, Notre Dame faced the juggernaut UCLA Bruins, who had strung together a record-smashing 88 wins in a row. In a nationally televised game pitting the #1 Bruins against the #2 Fighting Irish, UCLA held an 11-point lead with less than four minutes to play. Gary and his teammates initiated a full-court press that caught Bill Walton & Co. by surprise, and they reeled of 12 unanswered points to win 71–70. UCLA committed four turnovers during that span and missed all six of its shots. Gary hit for 25 during the game, dominating Keith Wilkes for much of the contest. Prior to the game, Coach Phelps had his players practiced cutting down the nets in anticipation of their victory. Gary’s final game for Notre Dame was a loss to Michigan in the Regional Semifinal of the 1974 NCAA Tournament. Gary entered the NBA Draft in 1974 and was taken in the first round by the Milwaukee Bucks with the 18th overall pick, and by the New York Nets in the sixth round of the ABA Draft. Gary signed with the Bucks, figuring the retirement of Oscar Robertson would give him a golden opportunity to show his stuff. He served as a backup to veteran guard Jon McGlocklin, averaging 8 points and 3 assists a game his rookie year. In 1975–76, he put up similar numbers backing up Brian Winters. The Bucks traded Gary to the Cleveland Cavaliers midway through the 1976–77 season with Elmore Smith for a pair of first-round draft picks. He continued to average 15 to 20 minutes a game. 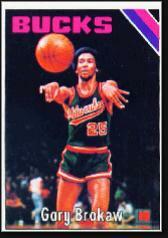 During training camp for the 1977–78 season, the Cavs traded Gary to the Buffalo Braves. He injured his back and played 13 games before the Braves released him. He was unable to catch on with another team. After his playing career, Gary coached for 10 years—five as an assistant to Digger Phelps at his alma mater, and five as the head coach at Iona. With Notre Dame, he recruited and developed fellow New Jerseyan David Rivers. Gary later took a position with the NBA as Director of Basketball Operations. In 1995, he accepted a job with the Orlando Magic as Director of Player Personnel, and then in 2003 he went to work for the Charlotte Bobcats as they prepared for the expansion draft. Gary coached Division II ball at Lees-McRae College in western North Carolina before moving to Tampa, where he runs the YMCA.